A systems genetics approach for deciphering macrophage-dependent wound healing. Study design showing 1,378 outbred mice subjected to a 2-mm ear punch and wound healing measured after 5 weeks. 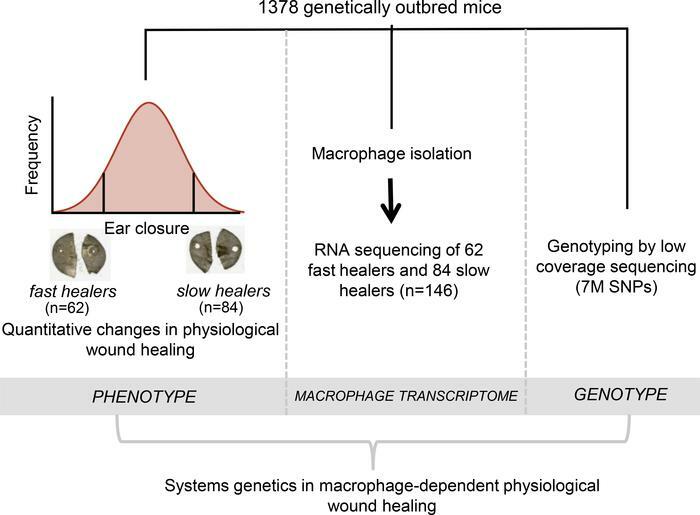 One hundred forty-six mice were selected at the extreme of the ear area distribution (62 fast healers and 84 slow healers) and their macrophages analyzed by RNA sequencing (RNA-seq). The available resources for these 146 mice are (i) quantitative differences in wound healing indicated as ear area following punch, (ii) RNA-seq in bone marrow–derived macrophages (BMDMs), and (iii) genome-wide SNP genotyping by low-coverage sequencing.